Julian Lombardi's Blog: Croquet Selected! 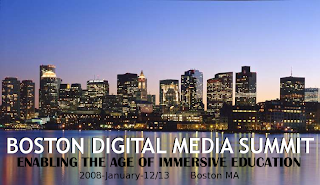 This past weekend, it was announced at The Boston Media-Grid Summit that the Immersive Education Initiative (see article on the initiative's goals) has selected Croquet as one of three official "next generation" immersive education platforms. The Immersive Education Initiative is an international collaboration of universities, colleges, research institutes, consortia companies, and foundations that are working together to define and develop open standards, best practices, platforms, and communities of support for virtual reality and game-based learning and training systems. The other two immersive education platforms selected were Sun's open source Project Wonderland client and the now open source Second Life client. What this all means is that the open source Croquet platform's value will become better known and that the Immersive Education Initiative will now direct both funding and programming resources towards the development and deployment of open source Croquet technologies and open source Croquet-based educational applications. Selection criteria for this important honor included the following: 1) support for the Windows and Macintosh operating systems; 2) availability as open source code; 3) vendor-neutral client and server architectures (no vendor lock-in); 4) stable and reliable runtime implementations; 5) integrated text chat and voice chat; 6) high resolution graphics; 7) multi-user support for collaboration; 8) highly customizable avatars that support high resolution graphics and body animation (gestures); and 9) support for user-created content. The event in Boston was an invitation-only affair hosted and sponsored by the Grid Institute, the Woods College of Advancing Studies at Boston College, and the City of Boston with participation from the Federation of American Scientists and the Ewing Marion Kauffman Foundation. Congratulations Julian and the Croquet team! We're extremely pleased that Croquet has been selected as an Immersive Education platform. This is a wonderful validation of Croquet's open source, open standards and open access approach to building robust, flexible and infinitely expandable immersive learning and research environments. Fantastic ! .. one step closer to forever changing the K-12 classroom and how kids imagine, create, and learn in 3D ! Great news !